The Franciscan Well Brewpub of the North Mall in Cork City has been promoting Irish Craft Beer for twenty years now, festivals become a part of the scene and the festivals here are some of Ireland’s oldest and most respected. The Cask and Strange brews festival is one where breweries get a chance to show how they can push the limits of brewing, expand styles and try out interesting and unusual beers. We have always gone to every festival the Franciscan Well host and provided beer, this time we nearly didn’t, we had planned to cask some Black Lightning for the festival but never got a chance to do so in the Christmas rush, however, we had brewed a pilot batch (75 litres) of the Mexican Imperial Stout last May and it’s been quietly maturing away undisturbed, we needed to see how the pilot would mature before scaling it up to 2000 litres. 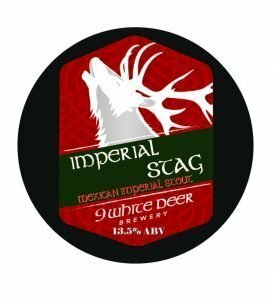 We opened up a keg of Imperial Stag and liked what we found, after this time we were happy with the direction it was going, all be it a little young yet, and decided to schedule it into production. This left us with a keg and a festival to enter. We drew up a tap badge and sent it in with only a day to spare as a late entry, we could not cask it as no yeast would survive the very high alcohol levels so it had to be gently carbonated in a keg. We attended the festival on Friday evening and tasted many great beers, ours was due to go on one of the rotating taps Friday eve or Saturday so we missed it, although we knew what it like it’s always great to get feedback from people as they try it. Saturday eve we got word it had taken first place, to be honest we were blown away, I was in two minds as to let it out or not as it would benefit from another few months maturing. We are very very happy to receive the honour, Imperial Stag came as an idea about a year ago or more, Imperial Stouts are very popular styles in South America, their own twist come into things with such choice in chilli peppers. After much research a recipe began to develop, one of the things I’m not a big fan of is astringency in a stout, this comas from roasted barley and black malts, instead we use lighter roasted malts (slightly) but in vast quantities, we needed chocolate, chilli and mocha flavours so in they went along with lactose and shed loads of hops. With so much going on it needed a healthy amount of hops to counteract all the sweetness but from sugars and alcohol. More is not necessary better because if it’s out of balance it will just be plain wrong, if the flavours do not work together in harmony it will be a complicated mess, that’s where the skill is, being able to get an idea of how all the flavours will merge, and patience. Imperial Stag will now go into production next week, it will be an unusual brew so I’ll take photos and write some notes, beers like this Mexican Imperial Stout at 13.5% abv don’t get made in an ordinary way, we’ll show you how we did it (well most of it anyhow). Sounds amazing! Congratulations. I don’t suppose any chance this one would be made gluten free too? Exciting! You guys are doing amazing things. Stag Saor on draught is my new favourite drink. Thank you.